Sold & shipped byProElectronics Distributing Inc. SO happy with this purchase! It had everything I needed to set. I got it for my son, I know nothing about gaming systems but set up was easy although time consuming. Graphics are great and it came with a 14 day Xbox gold trial card. I didn't want to pay for a bundle on games that were either too mature for him or that he didn't like so I saved a lot just by buying the console, remote came with batteries, can't get any better than that! Great Walmart price, as I did not like any of the bundled package games. This way I'm able to order the games I want to play. Takes a little getting used to and takes some time to setup and install updates. Great console. 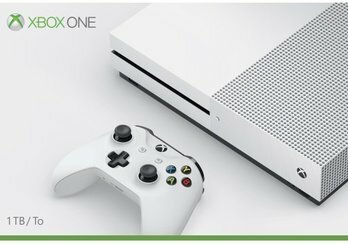 The 1TB console 4k seems updated compared to my other 2 (XBOX ONE S). Great price for the real bundle. Everything included as if you went to the store. arrived earlier than it was suppost too and so far so good. This is a much more slim line version of my Xbox 360. It fit's nicely into my package of electronics to include my 65 inch 4K TV. There are some features that facilitate a one stop solution to other pieces of electronics. One would be eliminating a separate Netflix DVD device. I am not impressed with the set up menu. I am very computer literate and can safely say it is complicated and labor intensive. While this device serves many purposes besides playing games, it is definitely not plug and play. The kit did not include an instruction manual. You will have to go online to download that. It did not include the two AA batteries for the controller. My impression of those two deficiencies is that Microsoft is trying to save a buck at the expense of it's customers. CHEAP minded. The device does what I purchased it for. But no company gets a 5 star rating from me if they are too cheap to include batteries and an instruction manual. $219.95 for a 1TB XBox One S is a great deal as I've been shopping online for a few weeks. I gave it a 3 star because 1) Does not come with its own rechargeable batteries and charging cable. 2) It's so slow to install games from disc (40min for 25GB). 3) 1TB is not what you really get to use. Mine was 755GB that I could use. 4) Downloading updates are fast for me as I have 100MB of speed but installing those updates took about 20min. Reminds me of how Windows 10 installs updates. 5) The HDMI that comes with it only is a 1.4 which displays frame rates at 30. The XBox One S is made for HDMI 2.0 displaying frame rates at 60. So it's a disappointment that I have to buy 3 more items to really complete this console but you can play it straight out of the box as it does come with its own HDMI cable and non-rechargeable batteries. And you may need to buy a bigger external SSD if you want more storage space. It did not meet the expectation,I cant even play the games with out an error or the system freezing up.I am completely disgusted with Walmart and the Xbox,starting to think this is probavly a common thing with Walmart and or Xbox.I am debating now how to return the junk and recover the extra 100 dollars i spent on the games that I cant even play!